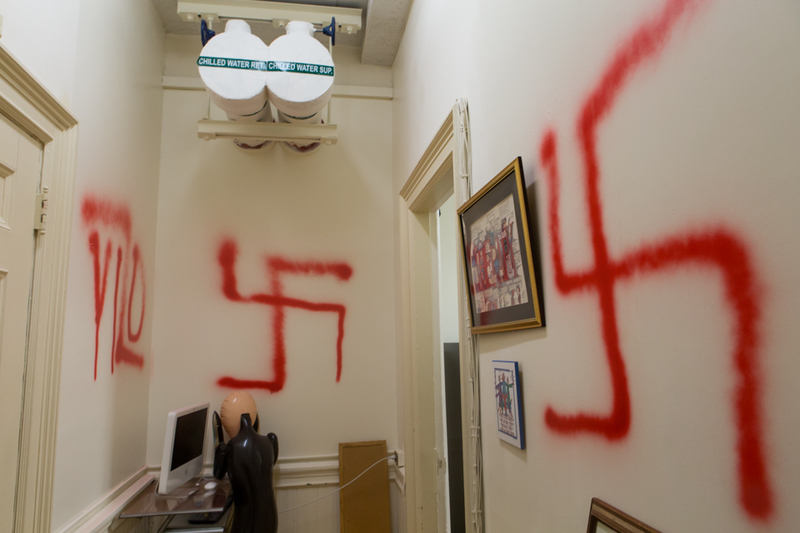 New York - Governor Andrew M. Cuomo today directed the State Police Hate Crimes Unit to assist in the investigation into two swastikas and an anti-Semitic slur that were found Wednesday spray-painted on the walls of the office of a Jewish professor and Holocaust scholar at Columbia Teacher’s College. New Yorkers who have experienced bias or discrimination are encouraged to call the toll-free hotline at (888) 392-3644 from 9 a.m. to 5 p.m. Monday - Friday or text “HATE” to 81336. Anyone who believes they have been a victim of a crime or are in immediate danger should always dial 911. The state offers a $5,000 reward to information leading to the arrest and conviction of a hate crime. Will they find someone or something? And will they prosecute (or simply allow the anti-Semitic University groups to continue? To get into this building a special key is required so it is likely a University person(s) but maybe that is just a false assumption.